In the 18th century, statisticians sometimes worked as consultants to gamblers. In order to answer questions like "If a fair coin is flipped 100 times, what is the probability of getting 60 or more heads? ", Abraham de Moivre discovered the so-called "normal curve". Independently, Pierre-Simon Laplace derived the central limit theorem, where the normal distribution acts as the limit for the distribution of the sample mean. Nowadays, statisticians sometimes work as consultants for economists, to whom the normal distribution is far from a satisfactory model. For example, one may need to model large-impact ¯nancial events in order to to answer questions like "What is the probability of getting into a crisis period similar to the credit squeeze in 2007 in the coming 10 years?". At ¯rst glance, estimating the chances of events that rarely happen or even have never happened before sounds like a "mission impossible". The development of Extreme Value Theory (EVT) shows that it is in fact possible to achieve this goal. Di®erent from the central limit theorem, Extreme Value Theory starts from the limit distribution of the sample maximum. Initiated by M. Frechet, R. Fisher and R. von Mises, the limit theory completed by B. Gnedenko, gave the fundamental assumption in EVT, the "extreme value condition". 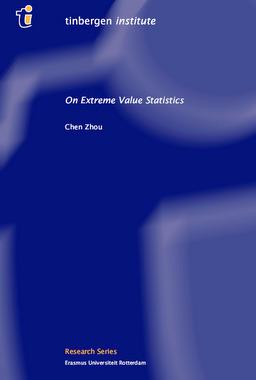 Statistically, the extreme value condition provides a semi-parametric model for the tails of distribution functions. Therefore it can be applied to evaluate the rare events. On the other hand, since the assumption is rather general and natural, the semi-parametric model can have extensive applications in numerous felds.